4BR has been informed of the death of Dr Roy Newsome, one of the great figures of the banding movement. 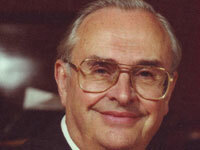 The brass band world is in mourning today, following the news of the death of Dr Roy Newsome, aged 81. He died peacefully at home surrounded by his family at 1.00am this morning, the 10th October. One of the truly great figures of the brass band movement, his influence and achievements touched every corner of the banding globe. On five occasions he led four separate bands to the British Open title as well as claiming a National title in 1986. His association with bands both great and small throughout the banding world gained him immense respect, admiration and life long friendships, whilst his 14-year tenure as the Musical Director of the National Youth Brass Band of Great Britain imbued a love of music to generations of young players. He married his beloved Muriel in 1954, becoming a partnership of love and devotion that bore two sons and a close knit family that included the recent arrival of their first great grand-daughter. His remarkable life saw him gain widespread admiration for achievements as a conductor, composer, arranger, musical director, broadcaster, author, adjudicator, teacher, lecturer, contest organiser and brass band visionary. In a mark of respect the Black Dyke Band, directed by Dr Nicholas Childs delivered an impromptu concert in front of his home on Saturday morning. Funeral details will be published on 4BR when they become available.